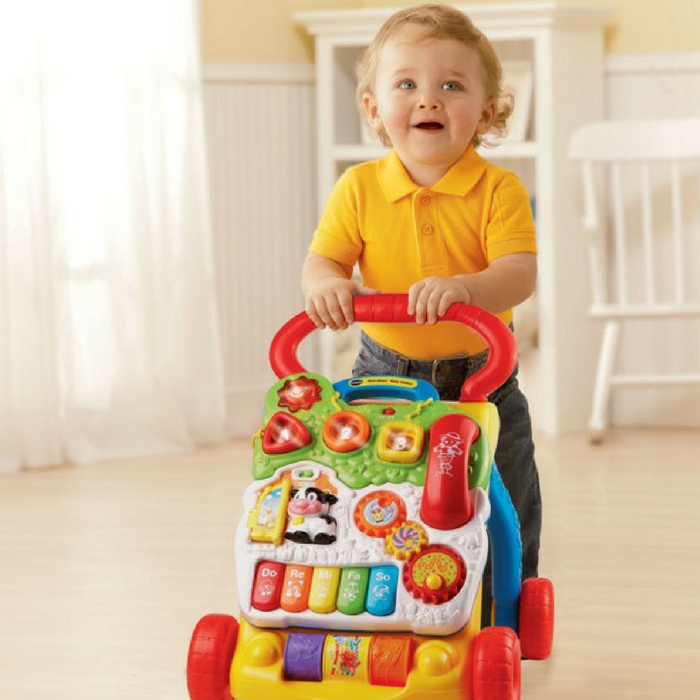 VTech Sit-To-Stand Learning Walker Just $19.99! Down From $35! You are here: Home / Great Deals / Amazon Deals / VTech Sit-To-Stand Learning Walker Just $19.99! Down From $35! Amazon is currently offering this #1 Best Selling VTech Sit-To-Stand Learning Walker for just $19.99 down from $34.99 PLUS FREE shipping with Amazon Prime or for orders over $25! From baby steps to big steps the Sit-to-Stand Learning Walker by VTech helps your baby develop from a crawler to a walker through adaptive technology. With a barnyard of playful friends to cheer them on, your little one will have endless fun as they learn to walk. Start out with the easy-to-remove activity panel for floor play or on-the-run fun, then step it up with the fun-to-maneuver walker. Spinning gears, five piano keys, three colorful rollers, three light-up shape sorters, three light-up buttons and a telephone handset offers endless fun that will stimulate your baby’s learning and develop their motor skills. The Sit-to-Stand Learning Walker keeps baby on track teaching shapes, colors, animals, music and more.